Chapters include: Lesson 1. The Nature Of Psychomancy, Lesson 2. How To Develop Yourself, Lesson 3. Simple Psychomancy, Lesson 4. The Astral Tube, Lesson 5. Psychometry, Lesson 6. 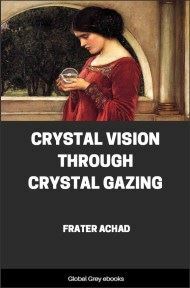 Crystal Gazing, Lesson 7. Astral Projection, Lesson 8. Space Psychomancy, Lesson 9. Past Time Psychomancy, Lesson 10. Future Time Psychomancy, and, Lesson 11. Dream Psychomancy. The term "Psychomancy" (pronounced, "sy-ko-man-see"), is derived from two Greek words, the first "psycho," meaning "the soul; the mind; the understanding" (and generally used to indicate "psychic" or unusual powers of the soul or mind); the second word, "mancy" meaning "to divine; to foresee, or foreknow; to detect secret things,"—and in occult parlance, "to sense," or "to receive impressions by the Astral Senses." So the word, as we use it, may be said to mean "Psychic Sensing," and in this work will be so used. The word "Psychomancer" means "one practicing Psychomancy;" and the word "Psychomantic" means "relating to Psychomancy." The word "Clairvoyance" is frequently used by people to designate some of the phases of Psychomancy, but strictly speaking this term is incorrect when used in this sense, the true occult meaning of the word "Clairvoyance," being "transcendental vision, or the perception of beings on another plane of existence—the seeing of disembodied souls, elementals, etc." And so, in this work, we shall consider the true phenomena of Clairvoyance, as distinct from that of Psychomancy. 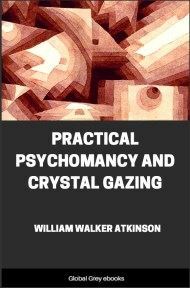 In this work, we shall regard as the true phenomena of Psychomancy, all the various phenomena known as Psychometry; Crystal Gazing; Perceiving Distant Scenes; a perception of Past Events, and Indication of Future Events; either in the full waking state; the state of reverie; or the state of dreams. And, so this work will examine, consider, and explain, the various phases of phenomena above indicated—in short, the phenomena of "sensing" objects by means of Astral Senses, omitting the phenomena of Clairvoyance, or seeing disembodied souls, etc., which we regard as belonging to a different phase of the general subject, and which require special consideration and examination. The majority of works upon these lines begin by an elaborate attempt to "prove" the reality of the phenomena in question. But we shall not fall into this error, for such we regard it. The time for the necessity of such proof is past. The records of the Societies for Psychical Research are full of proofs, and evidence, which are as full, complete and strong as ever required by any court to hang or clear a man. And the book shelves of the libraries are full of other books, giving like proof. 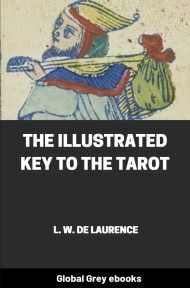 And, for that matter, this work is not written to convince people of the truth of this phenomena—it is intended for those who have already convinced themselves of its reality, but who wish for specific information regarding its nature, manner of manifestation, etc. 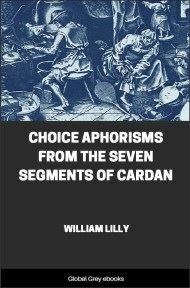 Where we quote instances of the manifestation of some form of Psychomantic phenomena, in this work, we do so simply to illustrate the characteristics of some particular form of the phenomena, and not as corroborative proof. With this explanation, we propose plunging right into the main subject itself. 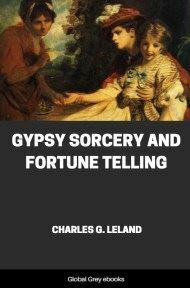 There have been many attempted explanations of, and theories regarding the phenomena of Psychomancy, some of which are more or less plausible, while others are quite visionary, "wild," and fantastic. 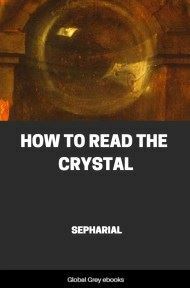 In this work, we shall pay no attention to those more or less ingenious "guesses" of the theorists, but shall, instead, give you plainly, clearly, and simply, the time-honored teachings of the advanced Occultists which teachings we believe to be the Truth, tested and tried by centuries of investigation, and experiment. The Occult Teachings inform us that in addition to the Five Physical Senses possessed by man, viz: Seeing; Feeling; Hearing; Tasting; and Smelling; each of which has its appropriate sense organ, every individual is also possessed of Five Astral Senses, which form a part of what is known to Occultists as the Astral Body. These Astral Senses, which are the astral counterparts of the five physical senses, operate upon what Occultists call the Astral Plane, which is next above the Physical Plane, in the Sevenfold Scale of Planes. Just as do the Physical Senses operate upon the Physical Plane, so do the Astral Senses operate upon the Astral Plane. By means of these Astral Senses, one may sense outside objects without the use of the physical senses usually employed. And it is through this sensing by these Astral Senses, that the phenomena of Psychomancy becomes possible. By the employment of the Astral Sense of Seeing, the Psychomancer is able to perceive occurrences, scenes, etc., at a distance sometimes almost incredibly far; to see through solid objects; to see records of past occurrences in the Astral Ether; and to see Future Scenes thrown ahead in Time, like the shadows cast by material objects—"coming events cast their shadows before," you have heard. By the use of the Astral Sense of Hearing, he is able to sense sounds over immense distances and often after the passage of great periods of time, for the Astral vibrations continue for many years. The Astral senses of Taste and Smell are seldom used, although there are abundant proofs of their existence. The Astral Sense of Feeling enables the Psychomancer to become aware of certain occurrences on the Astral Plane, and to perceive impressions, mental and otherwise, that are being manifested at a distance. The Astral Sense of Feeling may be explained as being rather a sense of "Awareness," than a mere "Feeling," inasmuch as the Psychomancer, through its channel, becomes "aware" of certain occurrences, other than by Astral Sight or Hearing, and yet which is not "Feeling" as the word is used on the Physical Plane. It may be well called "Sensing" for want of a better name, and manifests in a vague consciousness or "awareness." But still we must not overlook the fact that there are many instances of true "feeling" on the Astral Plane, for instances, cases where the Psychomancer actually "feels" the pain of another, which phenomena is commonly known as "sympathetic pains," "taking on the condition," etc., etc., and which are well known to all investigators as belonging to the phenomena of the Astral Senses.